It is important for organizations to keep their employees up-to-date with new products, policies, and procedures to remain competitive. E-learning is a learning format that gives learners control of how and when they choose to learn. It also helps organizations reach out to a geographically dispersed workforce and has the potential to meet the changing demands of businesses at lowered training costs. However, not to forget, e-learning comes with lots of challenges that have to be addressed while delivering online training. 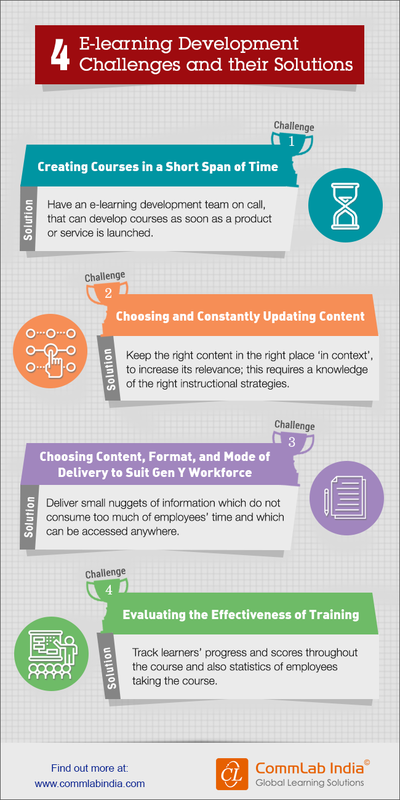 Here is an infographic on 4 e-learning development challenges and their solutions. Hope you now have an idea of how to overcome the challenges.